We provide a variety of work opportunities for individuals who have difficulty obtaining or maintaining jobs due to various barriers. We present realistic alternatives for people who have suffered a work-related injury or physical impairment and, as a result, are having difficulty resuming their normal work. Through a re-evaluation process, we test the individual’s abilities to determine current work skills. The systems that we use to help people obtain or return to work include facility and/or community work assessments, on-the-job training, real-work situations, supported employment, and direct placement services. These are done at no cost to the individual receiving services. This unique service is provided within the COR facility for persons needing additional work training to prepare for the "real world" of employment. When a person practices work skills in-house, he or she works in one of our production areas (outlined in the Facility Employment Services section) and is supervised by our specially trained staff members. 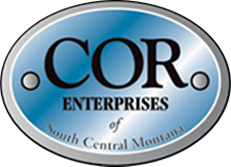 Wages are paid to the individual by COR Enterprises. The goal of this program is to help people to understand the demands, value, and meaning of work. We help individuals establish skills, personal characteristics, and work behaviors that will help them excel in the real work environment. Once workers reach a level of skill and understanding that is acceptable for placement, they are typically referred to the Career Guidance Center for community employment services. The purpose of this service is to help people learn about different jobs to better determine whether or not they would be satisfied with the type of work involved. It also offers job seekers an opportunity to establish if a particular job is compatible with their skills, abilities, interests, and personality. 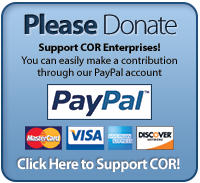 Work sites are in the community and wages are paid by COR Enterprises. All work is overseen by a job site supervisor or by Career Guidance Center staff. Assessments last for a few weeks and, when completed, a CGC staff member writes a full performance report and submits it to the referring counselor to aid in job placement. These services are designed for persons who have difficulty maintaining regular employment in the community. For such persons work areas include daytime work in the community, such as cleanup at Metra Park, working on janitorial or cleaning crews. We also have a complete woodshop where individuals operate power equipment and manufacture, engineer, and construct stakes, lath, hubs, rebar, wedges, stake chasers, custom projects, Adirondack chairs, and special orders that are sold to community businesses. Another work option is our nighttime janitorial program that includes work on a janitorial crew in the community or working with our stationary crew at the James F. Batten Federal Building. COR's trained staff works with participants to set goals for increasing productivity levels and improving work skills. Since wages for all jobs are paid by COR and are based on personal performance, participants come to understand the relationship between paid productivity and meeting their own financial needs. The goal of this service is to help workers find the right job for their skill level and for businesses to gain a valuable employee. Services are based on the amount of assistance an individual needs to be successful. These may include services with or without job coaching, assistance with transportation issues, and long term supported employment supports if needed. Placement services include intake and assessment, job development and analysis, and job modification and accommodations. Services are individualized to meet each participant’s needs. Our Career Guidance Center is also a Ticket to Work provider through the Social Security Administration. Contact Jennifer Schilling for more information about this program. CGC's vocational evaluation services are designed to help people identify work skills that best fit their individual abilities. The process begins with an interview to gather general information and determine any functional limitations to be considered during the evaluation process. After analyzing the results of the interview, an evaluation plan is developed which is tailored to the individual's specific needs and interests. The final evaluation includes written tests, job samples, psychological testing if needed, and/or a short assessment in a community worksite. Following the evaluation, a written report is created and then reviewed with the participant. This report highlights careers that will best meet the person's interests based on his or her strengths, abilities, supplemental test results, physical tolerance, work sample results and vocational recommendations. The entire process usually takes no more than three to three and one-half days.